At Jubilee Springs we have used our extensive engineering and design skills to create the perfect plastic mousetrap in Australia. Called the austrap, our trap is fabricated from both recycled plastic and quality wire and is designed to catch mice. We also manufacture a larger version of our product to catch rats. Our award winning austrap is 100% Australian owned by Jubilee Springs, 100% Australian manufactured, and quality endorsed. House mice and rats are some of the most troublesome pests in Australia and they thrive in a variety of conditions in and around our homes. They consume and infect foods meant for human consumption and also infect food preparation surfaces with their faeces, resulting in health problems such as food poisoning and Lymphocytic choriomeningitis (LCM). Mouse traps in Australia are the best way to end your infestation. Many people literally see a mouse running across the carpet in their home or hear them scratching in the walls or ceilings. You can also see evidence of their chewing on food packages in the pantry or their droppings on food preparation surfaces. Using the austrap mousetrap in Australia is the best way to eliminate your rodent problem. Protect all food sources from being eaten by mice and rats. This means that you need to place all food packets or open containers into plastic or glass containers that can withstand rodent attacks. Always make sure to clean up any dropped or spilled food from all surfaces immediately or you will only encourage the mice and rats to come back into your home. Declutter your home so that you don’t have lots of nice, warm and cosy spots where mice can breed. Mice are usually easier to catch then rats, because they are more curious. If you don’t trap a mouse or rat within a few days, then you need to change the location of the trap. Some suggestions to use for bait on our austrap products include, whole nuts, peanut butter, dry oatmeal, bacon squares, and cotton balls (they like these for bedding). 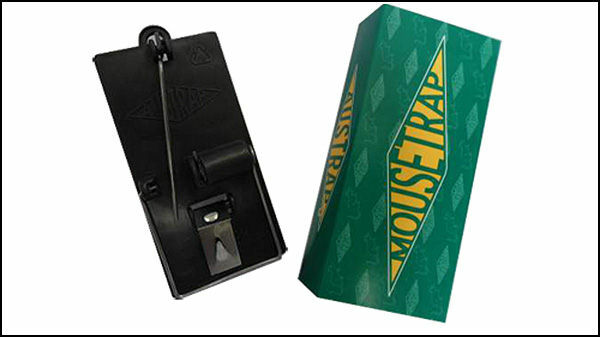 Austrap rat and mousetraps are sold in most major grocery and hardware outlets throughout Australia. At Jubilee Springs we manufacture an extensive range of custom made springs. We are also leading designers, manufacturers and suppliers of custom made springs in Australia. We are proud to manufacture, supply, and stock austrap products in Australia. For more information on our austrap products or custom made spring design in Australia, call us on 02 4389 1411, email us at websales@jubilee-springs.com.au or complete our online enquiry form.